U.S. aircraft carrier to Yemen to deter Iran. The USS Carl Vinson, a nuclear powered aircraft carrier, in Dec. 2011. 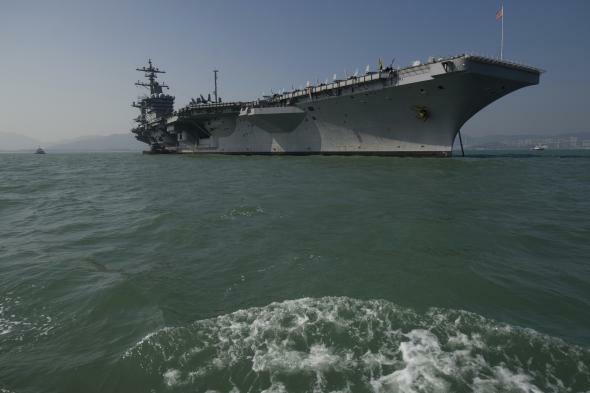 The U.S. Navy on Tuesday dispatched an aircraft carrier to the waters around Yemen as a heightened response to Iran supplying Houthi rebels in their fight against the U.S.-backed Yemeni regime that is currently in hiding. The USS Theodore Roosevelt is meant to be a deterrent in the Gulf of Aden after the U.N. Security Council voted last week to impose an arms embargo on the Shiite rebel group. The strategic positioning of military assets comes at a sensitive time in U.S.-Iran relations. The U.S. has provided logistical and intelligence support for the Saudi-led military campaign against the Iran-backed rebels in Yemen. The U.S. and Iran are currently deep into delicate nuclear negotiations. A Washington Post journalist Jason Rezaian has also been charged with espionage after nearly a year in detention.